For our July/August issue, Jeff & Sheri Easter landed on the cover and in a feature article, "Happy Together." 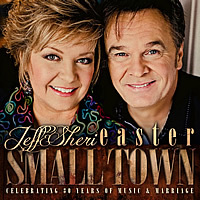 This year, they celebrate 30 years of marriage with a brand-new album titled Small Town. I had a lot of fun chatting with them both for that feature, and they had many more interesting things to say than we could fit in the article. So now, as Paul Harvey used to say, we'll give you the "rest of the story." In Part One of our two-part interview, Jeff talks about being married to his best friend, the charm of living in a small town (Lincolnton, Georgia), and the songs that speak to him. Congratulations on celebrating 30 years of marriage! How do you and Sheri keep love alive in your relationship? Respect, number one. And I think she’s more beautiful today than she was the first day I met her. She’s my buddy, my best friend; you know, we don’t have the boys’ night out and the girls’ night out. We each do have our other friends, but we just love being around each other and doing things together. If she has to go to the doctor, I always take her. If I’m sick, she goes with me. But I have a funny story … we do a love song every night, and I tell them that part of our ministry is to encourage the married couples in our audience. I posed the question and asked the older guys what the secret was to their marriages. And when we were in Branson, Missouri, I hollered to this guy, “Sir, what’s the secret to your 66 years of marriage?” And he hollered back, “Don’t fight!” (laughs) And if you can find somebody who can make you laugh, that will help you get through the bad days. What do you enjoy most about living in a small town? Morgan’s 21 now, and we built her a playhouse when she was about 5, so it’s getting pretty old. We’re remodeling it now for Maura, and I made the door a little bigger, because we always had to squat down to get in. Maura’s our tallest kid; she’s almost as tall as Sheri, and she’s 9 years old. So I went to the hardware store and asked, “Man, you got a good door I can get for my girl’s playhouse?” So he gave it to me for like eight dollars, a pre-hung door that had a little spot on it that he can’t sell—it was trash to him. So that’s the kind of stuff I love. Sheri and I have four rental houses, and it might be 7 o’clock at night and I need a plumbing part for one of them, and I can call my buddy and he’ll go open the hardware store for me to get what I need. And I always try to return the favor. What songs do you love most from your new album, and what makes them special? I love “Small Town Someone.” It’s a fresh, new idea. And Kenna (Turner West) wrote one for me, “This Side of the Dirt.” I enjoy that one, because it reminds me of me and my grandpa. He owned a junkyard and was a very simple man, and he’d load up old cars and burnt copper and sell them, and that’s how he made his living. That song reminds me a lot of having the peace and the love of God on this side of the dirt and a good name. Sheri’s daddy always said there’s only one thing that you’re born with and that you take with you, and that would be your name and what you make of it. Of course, “Jesus Loves You” is, I think, one of the greatest songs I’ve ever heard. It’s so simple and so good and so anointed. We do forget, even as Christians, how much God loves us and sometimes we have to be reminded of that. Sheri kept saying, “I want a choir,” and it was already so good just stripped down with just a vocal and guitar. I kept saying, “You sure?” So when Michael English came in to do the song “The Wave” with my boy, Madison, some other folks came over and before you knew it, we had about seven or eight people in the studio who could sing. So we stacked them, and it was an incredible choir. It was the first time we had orchestration, too. I really love that song. One of the first songs I picked out is “I Love You,” a song that my Uncle Edd wrote for his wife, Ann. He says, “I sing it to her every morning; I sing it to her every night. 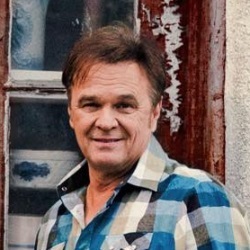 So if anything happens to me while I’m away from her or during the night, she’ll remember how I felt about her.” So I thought that was the neatest love story, and then when I heard the verses and the melody, it sounded like an old Ricky Skaggs song. I told the guys in the tracking room, “Y’all make this one as country as you can—I dare you!” They really countrified that one up. And I’m very proud of the song I did with Madison called “My Wave.” Jimmy Yeary, who co-wrote it with Ben Hayslip, sent me that song probably seven or eight years ago. There are a lot of other songs we’ve cut from that demo CD, but for whatever reason, I went back and listened to those songs again and that song jumped out at me. The line that got me was I’m gonna roll while I still can/So I can say to myself when I reach the sand/I did everything I wanted to. That kept rolling over and over in my mind, as well as the line I’ve been through some mean storms/And more than once they almost took me down … I can relate to that. That’s a great song. When we tracked, Sheri did four songs, I did four songs, and Morgan did two. But this one, we already had it tracked, and Madison asked, “Dad, would you care if I sing on that song with you?” First I thought, “Oh man, that’s my song!” Then I got to thinking, “Lord, that’s my boy wantin’ to sing with me, and he’s never done that.” Lyrically, the first verse fit him better and the second verse was better for me, so it worked out perfect. Since Madison has struck out on his own (to perform with his wife, Shannon), what has that been like for you? Missing being around him on the road, that’s the worst part. But he is more of a homebody — Sheri’s daddy was a homebody, her brother is a homebody, and our boy Madison is. He’s either in the studio or his house. It is an adjustment, but God has blessed us with Jared Easter, my first cousin’s boy. He’s been playing every instrument that you can name since he was like 5. He’s not just an average player; he is an incredible musician who plays steel guitar, banjo, mandolin and guitar. Of course, I play bass and piano, and then we have a new drummer, Joshua Phillips, and then with Jared, we have a whole band right there. It reminds me of the early Jeff & Sheri days when my brother Rabbit was with us. Do you have any funny or touching stories from the road to share? This story is funny and touching — literally touching. We all have struggles with our weight, and about two years ago, I was up to about 244 pounds. I’m 5’8’’, so I was pretty round, you know? And I knew I was overweight, but this little lady came up … I always tell folks, you know, there are some people whose “ministry” is to let you know when you’ve gained weight — that’s all they do. (laughs) Anyway, I’m standing at my product table and I’ve never laid eyes on this woman, and she reached out and started rubbing my belly. And I’m like, I’m not in the mood to get my belly rubbed. And I thought, “What would Jesus do?” And I just reached out and rubbed her belly back. She looked at me like she couldn’t believe I rubbed her belly, and I said, “Well, you rubbed my belly!” I got on stage and told Sheri, “You better watch it — there’s a belly rubber out there.” The majority of what we do is just fun, and there’s always something going on, especially if I’m around to keep it rollin’, keep it laughing. Tell us about the song "Like You're Still Here" and what it means to you. Madison told us about Mo Pitney [who wrote the song], and we put two and two together and realized we knew the Pitney family from way back when we first started singing. They had a rescue mission in Rockford, Illinois, and Mo was a baby back then. His mom and dad were always friends of ours. So I started listening to this kid and emailed him and told him I loved his stuff, and he sent me that song. I really, really liked the whole first verse. The second verse was about a pocketknife, and whittling and making something, and I called him back and said that I didn’t have that in common with my dad, but that we had guitars. So he rewrote the whole second verse for me and to honor my daddy. The first line of the first verse says, Today I used your old Craftsman socket set, and I asked my dad, “Daddy, did you ever have a Craftsman socket set?” And he said, “Son, that’s my favorite!” When I was at his house two weeks ago, he gave it to me. There was one tool missing, and I ordered it on eBay, so I’ve got the whole set. At my house now, I’ve got my daddy’s Craftsman socket set. I love the story of that song, “I’m gonna try to live as if you’re still here,” which means you have that much respect for your father—not only your heavenly Father, but your earthly father—so that you need to live your life like He’s watching us every day. And He is — Jesus is watching everything we do. And my daddy … no matter what I did when I was a young kid and thought I was getting away with some stuff, my daddy pretty much knew exactly what was going on. He could read my body language and what was going on with me, and ask questions. I’d ask him, “How did you know everything, Daddy?” And of course, the older I get, the smarter Daddy gets, you know. Then the story in the third verse about the Johnson boy walking down the aisle—my daddy thrives to see somebody get saved, because he knows where he was. My dad, the first time he knew Jesus, he was pullin’ a seven-year prison sentence in Halifax County prison as a young man. He said the devil had always told him, “You’ll never have a family.” And he just loves to love people. My daddy’s one of the nicest guys you’d ever meet. He never hurt anybody—just did a lot of ornery things when he was a kid. He turned himself in and did his time, then he got out and met my mama and got married and started a family. Which songs do audiences seem to be connecting with the most? They’re loving “I Love You” and “Jesus Loves You.” And then “The Light,” that’s the one … Bradley Gaskin came over to our house to write, and I was joking with him. I live right across the road from Sheri’s mama, and I said, “See that streetlight over there? That’s where I got my first kiss, right there.” So he started writing that song. I love Morgan’s song — both of her songs — but that one, “Someone’s Listening.” And then “More Than Enough” ... what a great song. I love that Sheri wrote Somebody needs to tell ‘em … He’s more than enough. I don’t think there’s a bad song on the record! How has performing changed for you over the years? I don’t think a lot. I love people and I love encouraging people, so I love doing songs. If a song speaks to me and makes me tear up like “Sitting on Top of the World,” that little love song we do.... In fact, Gaither fell in love with that one. He said he and Gloria have a thing in one of their houses that says, “Sitting on top of the world with our feet dangling off.” I didn’t have a clue they had that, but that’s just life. I like dealing with everyday life; people go through hard times. The one thing I do not like is to hear anybody putting down another person, whether it’s politics or preachers. The thing that really gets me is to hear one preacher put down another preacher. C’mon, man — you may not believe everything he says, but look at all the good they’re doing. Our ministry is more of encouraging people. I love to see souls saved, and we look at the seeds that have been planted from the songs that we’ve sung through the years. Sheri’s grandma always said you can attract more bees with honey, or whatever that saying is. Andy Andrews said it well: Smile when people talk, nod your head … people just need that. Sometimes you don’t have to say a word; you just act like that, and a smile. It’s amazing, you know? 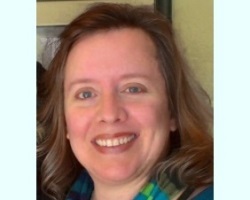 Click for our conversation with Sheri Easter in Part Two!